First, select the MP3 files whose file names you want to change. For this, the File Selection dialog can be used, or alternatively you can drag the files to be renamed onto the user interface. 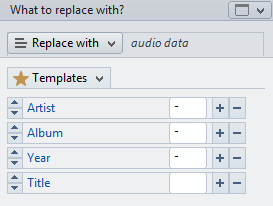 By using the filter you can narrow down the MP3 files to be renamed precisely by their properties. For example, you can specify that the files to be processed must contain audio data. 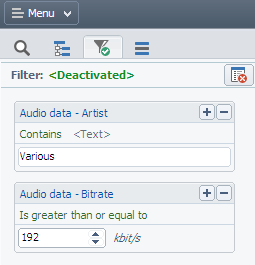 Or you can specify that they	need to have a particular artist name (e.g., Various Artists) in the ID3 information and a bitrate of 192 kbit/s or greater. 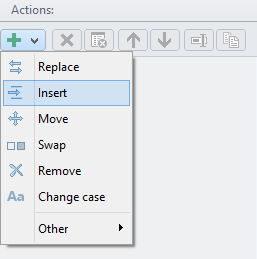 Click on the button featuring the Plus (+) Symbol and select the action Replace from the popup menu. In this example, the entire file name will be replaced by data from ID3-tags. For this, select the entry The Whole Name from the menu. Rename Expert supports automatic renaming through the use of metadata. 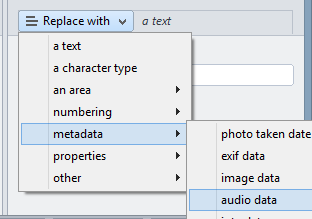 To use ID3 information for naming, select the entry "metadata -> audio data" from the menu. In this example, the new names of the MP3 files shall be composed as follows "Artist - Album - Track - Title". You can select these data conveniently from the menu and provide each with a separator, for example, a hyphen. Before the renaming, the new file names can be checked with the real-time preview after each change. List entries in green font color indicate that changes are planned for the corresponding file name and that there are no conflicts with existing files. If an MP3 file contains no ID3 information or the ID3 information to use (e.g., the artist's name) contains no data, no changes will be made to the file name. Finally, the Tasks dialog can now be opened by clicking on the Apply button. The MP3 files to be renamed are listed there, and the renaming process can be started by clicking on the Start button.